This 232-acre property contains important floodplain and upland forest habitat and wildlife habitat along the Androscoggin River. 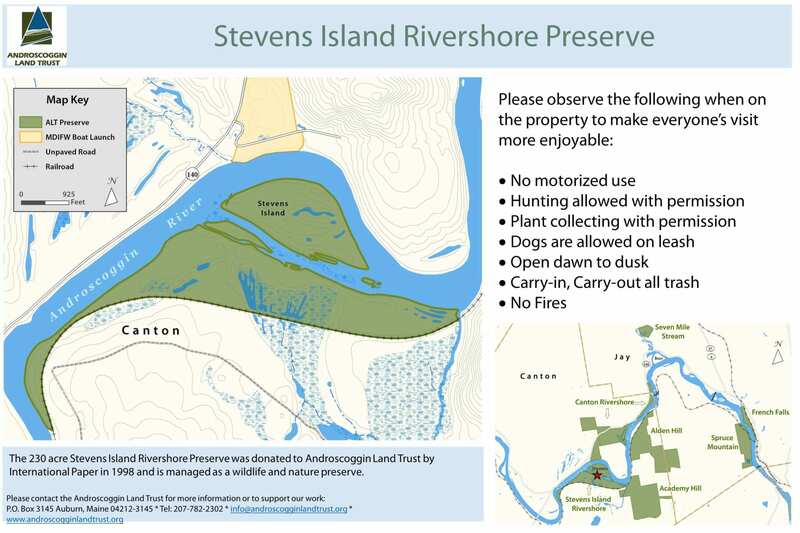 Donated to ALT by International Paper in 1998 as part of the FERC dam re-licensing project, Stevens Island contains two state rare natural communities: Hardwood River Terrace Forest and Silver Maple Floodplain Forest. As such, this property is managed to protect its exemplary wetland habitat for wildlife. Directions: Follow Route 4 north to the intersection with Route 108 and take a left onto Route 108. Follow Route 108 until intersection with Route 140 and turn right onto Route 140. Take Route 140 in Canton until intersection with Dorey Road (aka Rich Road) on the right. Note the blue “Public Boat Launch” signs. Follow Dorey Road to the boat launch and take a watercraft across the Androscoggin River to Stevens Island.